Staff Sergeant Makisha Stiles served in the U.S. Army and the Army reserves for more than 13 years, and was part of Operation Enduring Freedom. before being honorably discharged in 2014. For six years, Staff Sergeant Stiles was a human resources specialist. 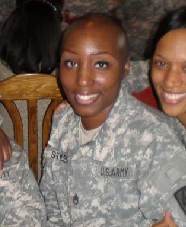 In 2011, Staff Sergeant Stiles was informed that she had breast cancer. The resulting treatments and surgeries took a major toll on her physical and mental health. She is now in remission. Staff Sergeant Stiles has also been diagnosed with lumbar strain and intervertebral disc syndrome, tinnitus, and right lower radiculopathy (femoral nerve). For her service to her country, Staff Sergeant Stiles was awarded the National Defense Service Medal, Global War on Terrorism Service Medal, Non-Commissioned Officer Professional Development Ribbon (3rd Award), Army Service Ribbon, and the Armed Forces Reserve Medal with “M” Device. Staff Sergeant Stiles was gifted a mortgage-free home in Powder Springs, Georgia in May of 2016.